activities, obtained from COMPASS-Kaduna, Aug. 2006. Although almost eradicated worldwide, polio is still endemic in northern Nigeria as well as in parts of Afghanistan and Pakistan. 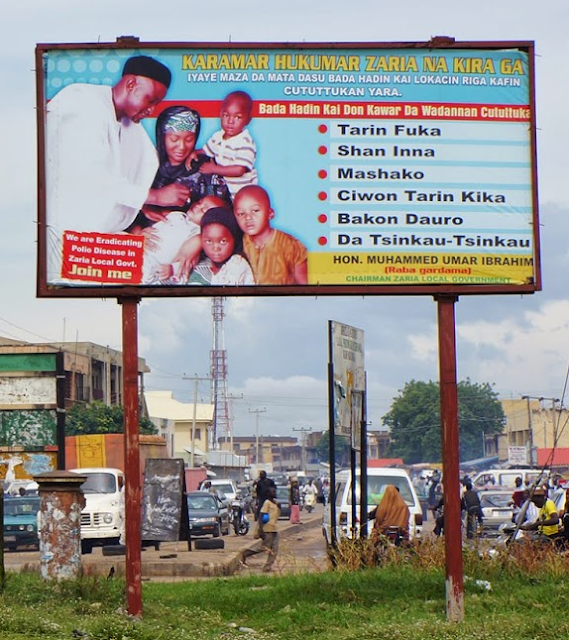 Public health campaigns in northern Nigeria such as those on polio have naturally included use of the Hausa language, which is dominant as a first language and lingua franca in that region and across the border in a large part of Niger. This post offers a glimpse of some materials. According to Elisha P. Renne, professor emerita of anthropology and Afroamerican and African Studies at the University of Michigan, polio education in Kaduna State, Nigeria included short films, calenders, pamphlets, radio spot, and billboard - all in Hausa. (The photos of two pamplets, figure descriptions of those two included as captions here, and one photo of a billboard featured in this blog post were kindly furnished by Prof. Renne). The text in the first two items (at right and immediately below) is in standard Hausa boko script. on the 2005 calendar, sponsored by UNICEF and the Nigerian Ministry of Health. There are various YouTube videos about polio in Hausa, including "majigi" films such as the below on polio prevention (part 1 embedded, parts 2 & 3 linked below; links to these were supplied by Prof. Renne). Part 2 of 3 "In Kunni Yaji, Jiki Ya Tsiria"
Part 3 of 3 "In Kunni Yaji, Jiki Ya Tsiria"
None of the videos as far as I've seen have been same-language subtitled, though that would be an interesting way to combine literacy with health education. This is a very limited look at what is probably a considerable amount of material in Hausa on polio prevention, as well as on other health issues. One question is how well such materials are reviewed for accuracy of information and consistency of terminology. Nicholas Awde, 1996, Hausa-English/English-Hausa Practical Dictionary, Hippocrene. Baba Mai Bello, 2015, The Perception of HIV/AIDS among Students in Northeastern Nigeria, LIT Verlag Münster. 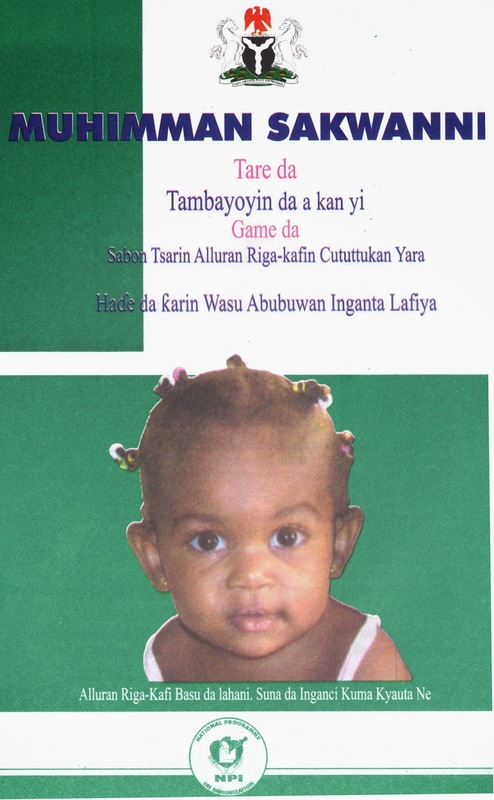 Elisha P. Renne, 2010, The Politics of Polio in Northern Nigeria, Indiana University Press. NB- Prof. Renne forwarded the images and information with an email response to an inquiry I made about her book cited above. The email exchange took place in April 2015.